Everyone wants to make more money and have a fulfilling career. 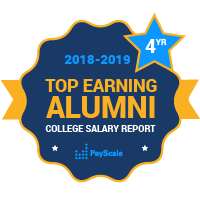 Learn more about Rhode Island’s top two-year colleges based on alumni salary. Rhode Island is one of the smallest states in the country, but PayScale has salary data for a selection of community colleges that offer associate degrees in The Ocean State. The Community College of Rhode Island is the home to some of the highest paid graduates with associate degrees. The Community College of Rhode Island’s main campus is in Warwick, but there are five other satellite campuses. Four percent of associate degrees from CCRI are in STEM subjects. The New England Institute of Technology is a private not-for-profit college that emphasizes science, technology, engineering and math subjects.